It was a major career switch for Madam Chetra Doraisamy, 45 - from cleaning offices and hospitals for about 30 years, to brewing speciality coffee at cafes. "I wanted to change my life," said the mother of four. She was struggling with low self-esteem and going through a divorce when she was referred to Bettr Barista by a social worker at her church in February. The coffee academy was named Social Enterprise Start-up of the Year at yesterday's President's Challenge Social Enterprise Award ceremony, which is now into its second year. Besides teaching coffee-making, the academy also helps at-risk youth and women from disadvantaged backgrounds with emotional management and physical skills training such as self-defence and yoga. Receiving the Social Enterprise of the Year award from President Tony Tan Keng Yam at the Istana were two organisations - Bliss Restaurant & Catering and Sata CommHealth. Bliss, which has four outlets here, employs people with physical and intellectual disabilities, at-risk youth and former offenders, among others. Sata CommHealth, formerly known as the Singapore Anti-Tuberculosis Association, provides affordable health-care services to the needy and disadvantaged. It has four medical centres - in Bedok, Ang Mo Kio, Jurong and Woodlands. Earlier this week, it opened a community health centre in Jurong, providing support services such as counselling and physiotherapy. The three award winners each received a trophy and cash prizes of between $10,000 and $15,000. As part of a new initiative, the winners will also receive guidance from corporate organisations to develop their capabilities in areas such as how to manage finances and business legalities. A total of 38 applications, from around 20 per cent of the social enterprises here, were received for all three categories. Ms Low Yen Ling, Parliamentary Secretary for Social and Family Development, said she was glad to see more social entrepreneurs contributing through a greater variety of ways. "These ideas have given new meaning to how we can make a positive difference for a better Singapore," she added. For Madam Chetra, Bettr Barista has made a difference in her life in several ways. After her eight-week internship at French eatery Saybons in Aljunied earlier this year, she was offered a full-time job there. Last month, she was promoted to manager, and now earns about 11/2 times what she did as a cleaner. She has also gained more self-esteem. "Last time, I was very dependent on people. Now, I'm more confident," she said. She hopes to help others like herself. "There could be other Chetras hiding somewhere. I hope they'd be willing to come out and I want to help them." 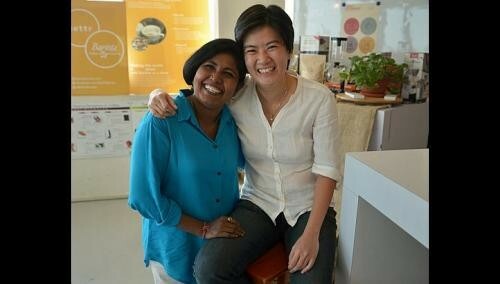 Bettr Barista's 37-year-old founder Pamela Chng, pointing to Madam Chetra, said: "These guys keep me going. They were so shy when they started, they couldn't have a conversation with anybody. But now they're holding down jobs, getting promoted, talking to you - which shows how well they're doing."